ServerSocketANE is an Air Native Extension (ANE) for ServerSocket on mobile platforms. The ServerSocket class is not available on mobile platforms directly from Adobe in the Air SDK. This extension implements the API on the iOS platform. The package path com.thejustinwalsh.net is a direct analog to flash.net and the extension implements a working default package as well. So everywhere you would use flash.net.ServerSocket use com.thejustinwalsh.net.ServerSocket instead. 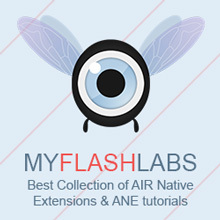 Air Native Extension MIT. URL.